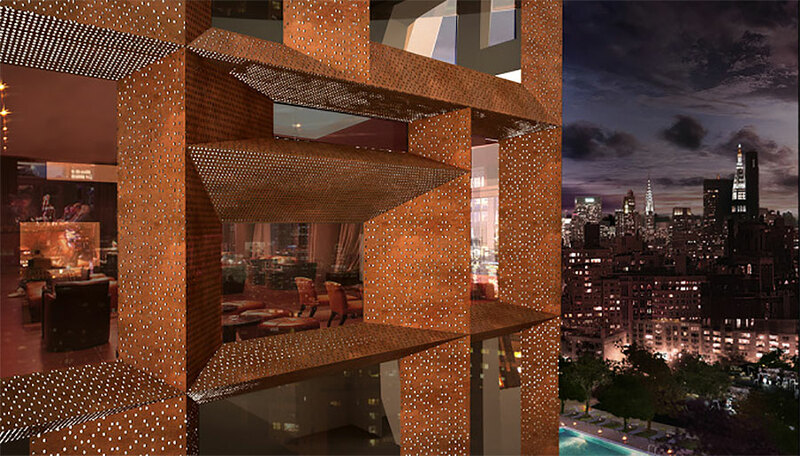 As this angular copper facade ages, its reddish brown skin will settle into a weathered green. 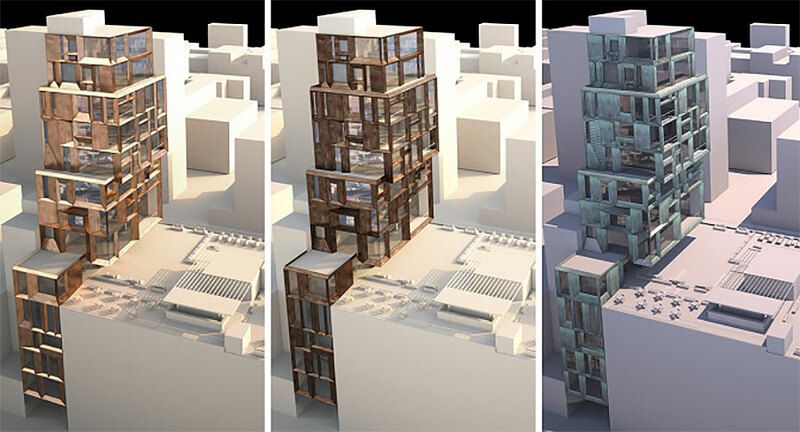 It’s a sort of physical embodiment of the changes playing out in Manhattan’s Lower East Side and Chinatown as the city’s voracious luxury residence market continually searches for a new frontier. The so-called LES Tower at 57 Orchard Street sits between Grand and Hester streets, on the doorstep on Chinatown where signs filled with exotic typefaces make neighbors with minimalist galleries and cafes. 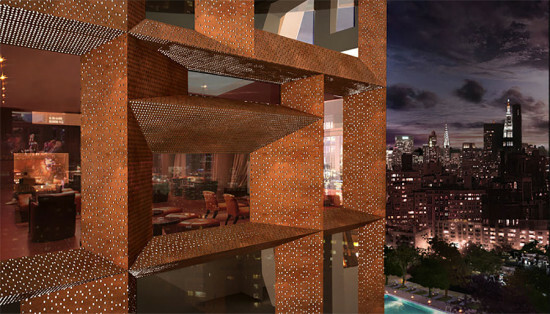 Designed by New York–based DXA Studio, the 15-story building is mostly covered in glass neatly framed by perforated copper. 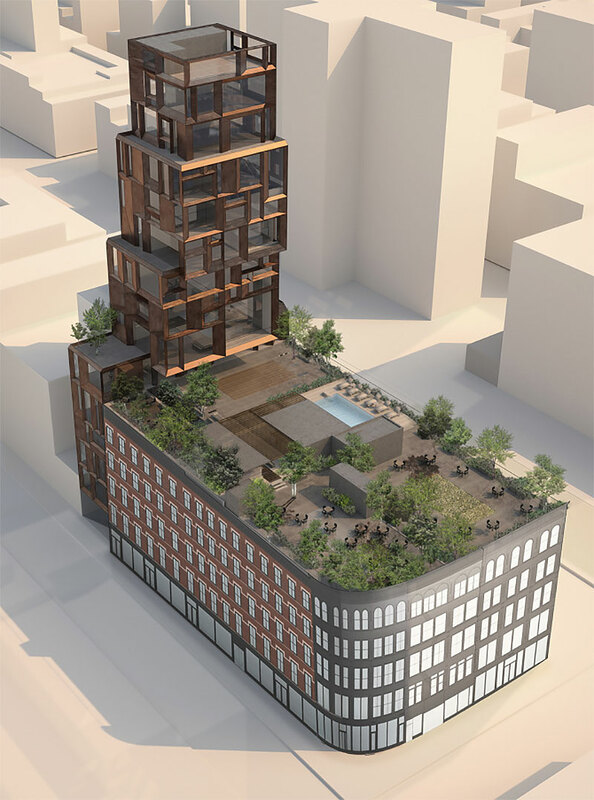 The 23,600-square-foot structure will be slotted into a slender mid-block parcel overlooking the predominantly mid-rise streetscape—a feature that helped developers amass air rights to push the tower up into the sky. 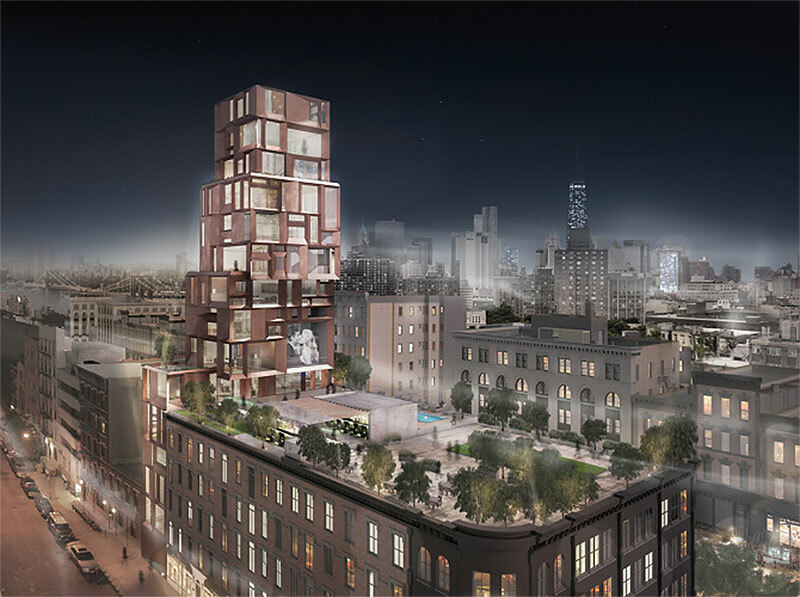 A series of prewar buildings will also be rehabbed as part of the larger development, with a unified roof deck among the project’s amenities. The Lower East Side has become known for its high-design “finger buildings,” including Bernard Tschumi’s BLUE Tower, SANAA’s New Museum, Norman Foster’s Sperone Westwater Gallery, and Grzywinski + Pons’ Hotel on Rivington. Herzog & de Meuron is also currently working on a tower farther north for hotelier Ian Schrager. These new luxury outfits are a marked departure for a neighborhood that got its start as home to New York’s notoriously overcrowded tenements. The building is projected to open in 2017, pending approvals from the city.